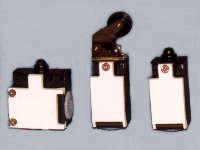 Klockner Moeller limit switches, series AT11, AT12, AT21, with various contact configurations, actuator heads and rollers. 1 N.O. & 1 N.C.
1 N.O. & 2 N.C.
2 N.O. & 1 N.C.